Digital media offers the Catholic Church another opportunity to spread the Good News, which is what our faith calls us to do, Bishop Christopher J. Coyne recently told a national gathering of young adults in Indianapolis. 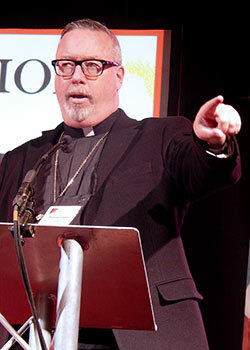 Bishop Coyne, shepherd of the Diocese of Burlington, Vt., and chairman of the Committee on Communications of the U.S. Conference of Catholic Bishops (USCCB), was a keynote speaker during the National Catholic Collegiate Conference (NCCC), which is open to people ages 18-25 and held simultaneously with the National Catholic Youth Conference. NCCC was co-sponsored by the National Catholic Young Adult Ministry Association and the National Federation for Youth Ministry. That content, he continued, is more than just the Internet, its websites and videos, blogs, podcasts, images and text. Why does the Church need to be present in digital media? Bishop Coyne offered an example of how digital media played a key communications role during Pope Francis’ recent visit to the U.S. The USCCB, he said, set up social media platform rooms in all three cities the Holy Father visited—Washington, New York and Philadelphia—which were manned by 20-25 volunteers and some professional staff. “What they did all day long was they were in the room with their computers, and they were just basically paying attention to what was going on on Twitter, what was going on on the USSCB hashtags, what was going on in terms of Facebook,” he noted. Over the six-day period, Bishop Coyne said, the USCCB team produced nearly 2,500 pieces of social media content, including 62 real-time videos in English and Spanish, which resulted in 18.5 million content impressions. “That’s 3,000 impressions per minute. That’s people coming to check it out, looking at it,” he noted. “During the week, the English and Spanish Facebook page posts reached 8 million people, and engaged a half million of them. St. Thérèse of Lisieux, who was known for her “little way,” would be a good patron saint for those involved in digital media, he added.